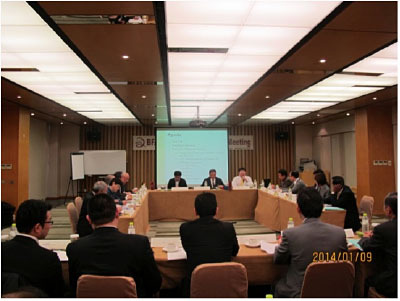 Baseball Federation of Asia (BFA) convened its 2nd Executive Committee (EC) Meeting under the leadership of President Tom Peng who is also 2nd Vice President of International Baseball Federation (IBAF), in Chiao Hsi, outskirts of Taipei, Taiwan on January 9, 2014. EC members discussed among other things to ensure successful operations of baseball games during the 17th Asian Games in Incheon, Korea in September, 2014 by sending 47 officials in response to the request from the Organizing Committee. The Meeting approved to expand Asian Championship from 6 to 8 teams to encourage more countries to play with the top 4 in Asia; Japan (IBAF ranking 2), Korea (4), Chinese Taipei (8), and China (20). All the EC members supported BFA’s plan to vigorously conduct coaching clinic and acknowledged the continuous efforts to develop baseball in East and West Asia, including Arab Countries. Yoshinobu Suzuki, BFA Vice President and Director of Japanese Olympic Committee reported prospect of inclusion of baseball and softball in 2020 Tokyo Olympic. Guest speaker, President Yasuhiko Nagase of Nagase Kenko Corporation, updated technical aspects of Kenko Rubber Baseball (K-Ball) being used by Junior Tournament of BFA, COPABE and a few European countries and assured EC Members safe, economical and environmentally friendly features of K-Ball.